Coinciding with the launch of the Galaxy Tab S 8.4 and 10.5, Samsung have announced the availability of a selection of accessories that complement their new tablets perfectly. The Book Cover accessory configures to three different display angles to provide the most comfortable position to watch videos, read or type. For users looking for the same protective structure of the Book Cover but with a slimmer design, Samsung offers the Simple Cover for perfect fitting, lightweight protection. As with most Tablets these days, Samsung have come up with the Bluetooth Keyboard that is designed specifically to offer the utility of a laptop keyboard for your Android Tablet. On top of that, Samsung have also introduced their Level Audio products, the Over, On and In. Named after how the device sits on/in your ear, they look quite decent as a companion to your tablet. 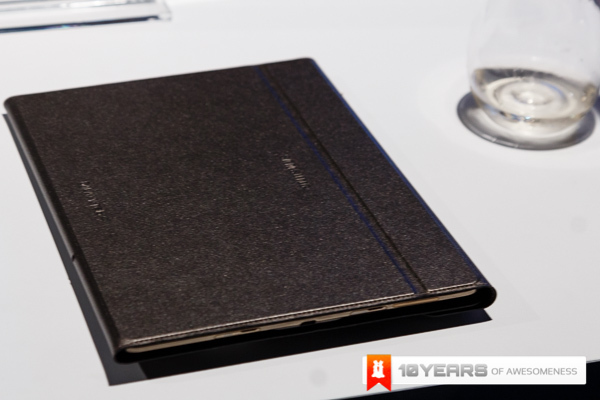 To enhance the portability and productivity of the Galaxy Tab S, Samsung has designed a sleek and tailored Book Cover. The cover connects flawlessly to the Galaxy Tab S with a unique Samsung-developed ‘Simple Clicker’ – click and lock method – to stay secure and fit seamlessly without adding extra thickness. The foldable book cover is lightweight and features a premium, matte finish with a subtle stitch that perfectly complements the Galaxy Tab S. It also sports a soft texture grip for maximum comfort in-hand. The cover can be adjusted to three different, versatile angles: Viewing Mode for an optimal viewing experience when watching videos; a new Touch Mode enables a comfortable angle when using the Galaxy Tab S on a flat surface; Typing Mode angles the display in a way that makes it easy for users to type without strain. The auto power on/off lets the device to turn on and off automatically with the open and close of the cover. 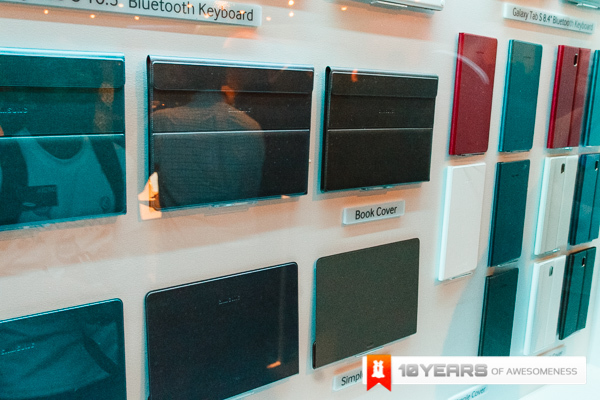 For users looking for the same protective structure of the Book Cover, but with a slimmer design, Samsung has created the Simple Cover. This sleek, protective cover easily snaps to the back of the Tab S to offer users a stylish option to guard their device. It also comes equipped with a soft touch grip for maximum comfort in-hand. The auto power on/off enables the device to turn on and off automatically by opening and closing the cover. 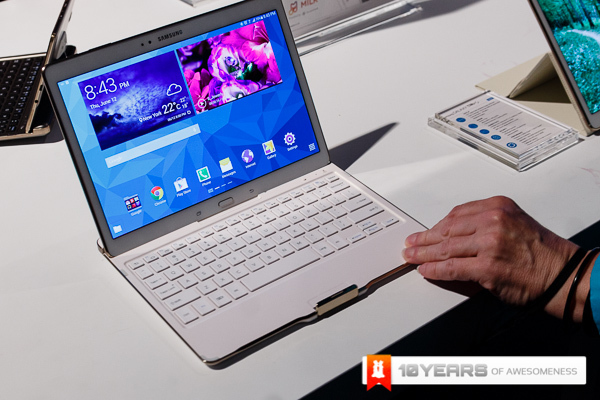 Taking the functionality of the Galaxy Tab S to the next level is the Samsung Bluetooth Keyboard. The keyboard is designed specifically for the Tab S 10.5-inch tablet and is constructed from identical materials, sharing complimentary style aesthetics for a seamless pairing. This keyboard offers the same design as that of a laptop keyboard, making it more intuitive and optimized for Galaxy users with specific hot keys and curved keycaps mapped to Galaxy Tab S features like Multi Window, S Finder and Screen Capture for quick and easy access. The keyboard’s ultra-slim, sophisticated, ergonomic design and rechargeable battery provide further portability. Users will be able to increase their productivity when typing and gain increased control when gaming with the Bluetooth Keyboard. Level Over: Samsung’s flagship over-ear headphone featuring superior HD organic sound, a comfortable ergonomic design, touch controls and wireless Bluetooth pairing. A 50mm Dynamic Driver made with high performance Neodymium lets users get deeper, more natural sound. Level Over also uses a hybrid type active noise cancellation, both on the headphone inside and with a mic on the outside that picks up sounds to block so that users can enjoy crystal clear music. Level On: Combines a compact style with a superior comfort and sound system to offer an immersive and on-the-go premium sound experience. It is designed to provide a full range of natural and clear sound, flexibly dampening the airflow with a 40mm dual layered diaphragm. Level In: Provides an immersive sonic environment for any activity with a powerful three-way speaker, letting users enjoy rich sounds that cover all the low, mid, and high sound naturally and with clear sound separation.